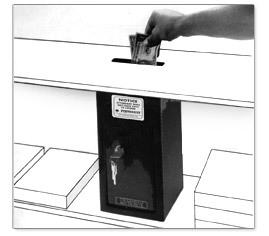 This In-Room Safe Deposit Box is made in the USA. Anti-fish baffle deters removal of contents. PV-27 Equipped with security lock with two (2) keys. For horizontal installation. 6″ x 6″ x 11-1/2″ 12 lbs. 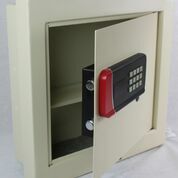 PV-27M Equipped with Medeco high security lock with two keys. For horizontal installation. 6″ x 6″ x 11-1/2″ 12 lbs. 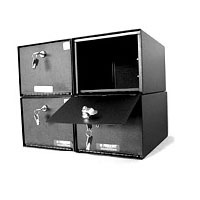 PV-27K Equipped with dual custody safe deposit lock with with two (2) operator keys and one (1) guard key. For horizontal installation. 6″ x 6″ x 11-1/2″ 12 lbs. PV-27S Equipped with security lock with two (2) keys. For horizontal installation. 6″ x 6″ x 7-1/2″ 9 lbs. PV-27S-M Equipped with Medeco high security lock with two keys. For horizontal installation. 6″ x 6″ x 7-1/2″ 9 lbs. 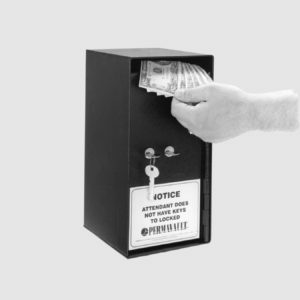 The instant you deposit cash, valuables, or personal belongings, Perma-Vault is on guard, helping to protect you against robbery and theft. 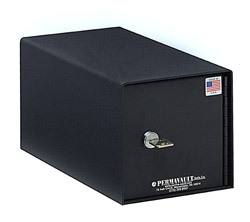 Perma-Vault PV-27 can be used in hotels, employee security areas, swim clubs, etc, and is perfect for multi-unit installation. WE WELCOME THE OPPORTUNITY TO ASSIST YOU IN YOUR SECURITY NEEDS. Our customer support team is second to none and has worked closely with many of the largest fast food restaurant chains, hotels, federal and local government facilities, department stores, national retail store chains and convenience stores throughout the country.